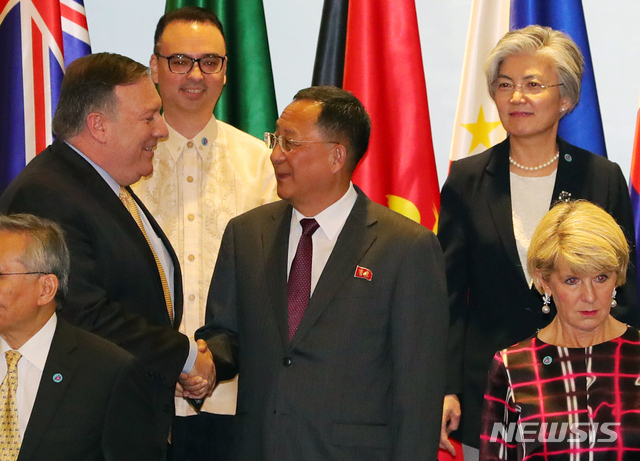 North Korean Foreign Minister Ri Yong-ho encountered his American counterpart Mike Pompeo in Singapore on Friday at the opening of the ASEAN Regional Forum. They shook hands with each other and exchanged words, as Pompeo approached Ri first with a smile. The annual ARF is the sole regional forum in which the North's top diplomat participates. It also brought together the foreign ministers of more than two dozen countries, mostly Asia-Pacific nations. After a photo session, Sung Kim, the State Department's top Korea expert, delivered an envelope of documents to Ri. Kim, currently the ambassador to the Philippines, is a member of the US delegation to the ARF. But chances seem low that Ri and Pompeo will sit down together for formal bilateral talks. The secretary is leaving Singapore later in the day.